This has never happened before. It may never happen again. This could shock you. I don’t know. Do you have a high shock tolerance? You have my apologies if this shocks you. Ladies and gentlemen (I know I have some readers in both categories, although ladies do, predominantly, love Second Breakfast), I have an announcement to make: I am taking a break from Octoberween this week. I know. It is shocking. I don’t know what I was thinking. I’m sorry. I have to do it, though. I have to. 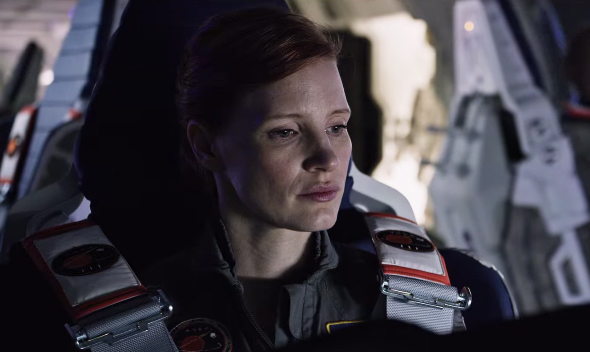 The Plot: When a cataclysmic storm hits their base on Mars, a group of astronauts, led by Commander Melissa Lewis (Jessica Chastain) must make a hasty departure back to Earth. 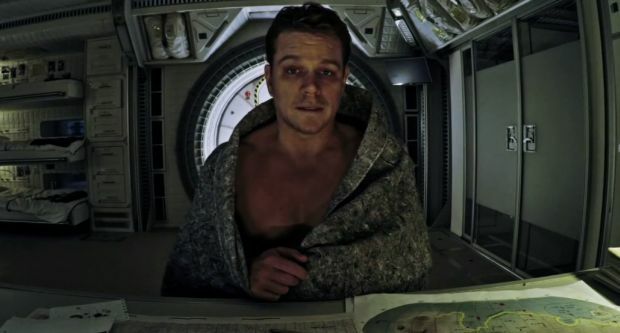 In the confusion of the disaster, one of the astronauts, Mark Watney (Matt Damon), suffers a killing-blow from debris and, consequently, must be left behind. One problem: Watney’s not dead. Presumed deceased and abandoned without a way of contacting NASA, Watney commences an extraordinary struggle for survival, the only living thing on an entire planet. Exodus, The Counselor, Prometheus, Robin Hood, Body of Lies. I am, perhaps to a fault, a staunch and enthusiastic defender of Ridley Scott, but his last five films in a row failed to meet with widespread critical acclaim. Many were, obviously wrongly, saying that he was washed up and his art had left him. That dude needed a win, and I cannot express how glad I am that he finally got one in The Martian. 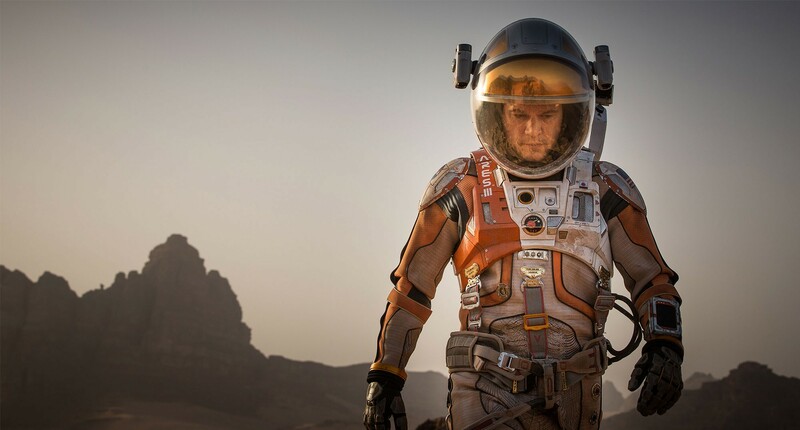 Everyone seems to really like The Martian, both audiences and critics. You know what makes me even happier than the fact that The Martian is receiving acclaim? The fact that it deserves every bit of it. Most Jessica Chastain movies do. I have, strangely, nothing negative to say about The Martian. I don’t mean to imply that it’s a perfect, flawless film, but in this rare case, I can’t complain. It feels wrong. I just can’t see what the advantage would be in pointing the few things that didn’t work. Ain’t nothin’ to gain there. That could result from the film’s generally positive atmosphere. This is going to sound weird, and I know we still have a couple months left, but I’m just going to go ahead and declare it: The Martian is the feel-good movie of the year. Most “feel-good” movies achieve that name ostentatiously, cueing certain emotions and telling the viewer to feel good. The Martian doesn’t tell you to feel good, it makes you feel good. Many have noted the film’s overwhelming positivity. This strikes me as odd. Damon’s Watney struggles under incredible duress against impossible odds, recognizing that death awaits around every corner, but never giving up. I think we’ve grown to expect existential turmoil and inner conflict. Protagonists with admirably single-minded convictions (other than revenge or some other socially taboo thing) have become so few and far between that when they do pop up, everyone talks about how refreshing and original it is. It’s not original, but it is refreshing. In this respect, The Martian feels pleasantly old-fashioned, because, for some reason, “good guy trying hard at something” is no longer in vogue. I hope that the universal acclaim and box office success of this film will indicate to filmmakers that, every now and then, it’s okay to send a positive message. The new face of positivity. Of course, none of this is meant to imply that The Martian is all a carefree giggle-fest, a phrase real critics likely use as well. Obviously, getting stranded on Mars without any help, transportation, or mode of contact doesn’t start Watney off in a good place, and despite his best efforts, not everything goes swimmingly for the rest of the movie. A good story has its ups and downs to generate excitement, and this is, if I haven’t already implied this, a good story and very captivating. The two-and-a-half hour runtime flies by amid all the excitement, generated in part by the perfectly paced screenplay, in part by Ridley Scott’s expert direction (seriously, this is old school Scott and it’s great), and in part by great performances from a great cast, including in addition to Damon and Chastain, Chiwetel Ejiofor, Jeff Daniels, Kristen Wiig (who I normally do not like), Kate Mara, Sebastian Stan, Donald Glover, and Sean Bean (who, spoiler alert, actually doesn’t die in this movie). This paragraph contains SPOILERS SPOILERS SPOILERS so yeah, you’ve been warned. I made a joking comment about the fact that Sean Bean, who remains out of harm’s way for the entire movie, somehow survives, and the guy I was talking to remarked, “Oh yeah, he makes it out just fine,” to which I responded by pointing out, in fact, nobody died in this movie. That surprised him. Why is it always surprising when no one dies in a movie? Or is it just a surprise if no one dies in a Ridley Scott movie? I kinda get that. I’ve remarked on this before, but why do we always expect movies to be so deadly, and also apparently very negative? Well, nobody dies in The Martian, it has a positive message and attitude, and it’s exciting, entertaining, and very well made. It is an ideal time at the movies. So, yeah, to synthesize the point of the last eight hundred words: I recommend this movie.